– How did you find out about parkour? I found out about parkour like the majority of us, over the internet, watching the guys jumping over things! For almost a year I had imitated them on my own, until I got acquainted with the community and began training seriously. – With whom did you start to train? Did that person supported you to progress? The mere process od “beggining” is not clear to me, but I can say that I started training with my friends from elementary school and with Petar Ivančević from Novi Sad, and later I trained with around 15 traceurs from Belgrade. They all supported me to progress in different ways, that`s what community is for, and I believe that I have supported them as well. – Do you consider yourself a traceur? Yes! Of course, it depends on what the individual believes the word means, but for me, the traceur is a person who does not just train parkour, but lives it. Not in the sense that parkour is the only thing in the person’s life, but that the values ​​acquired through parkour he transfers into everyday life, and vice versa. Therefore, parkour will play a big role in that persons` life. – What impact does parkour have on your life and is it the most important thing in your life? Parkour currently makes quite a big part of my life. I do not like to prioritize these things, nor to glorify only parkour, but in general, training is one of the most important things in my life, a philosophy that has helped me build my personality. As I noted above, I consider myself as a traceur! – How strict is your training routine? Do you go out to practice with the intention of doing just precision jumps and then you do only that, or you just go out to train? I am one of those people who like to plan their training. Why? Because I am aware of my deficiencies, and I exactly know what I need to do. But, of course, usually once a week on one of those group trainings I don`t act according to plan and I train what I want at that moment. The combination of all this, in my opinion, gives the best results, but I will always give a great advantage to planning. – When confronted with fear when doing new challenges, what is your approach in solving that problem? I didn`t faced fear for a long time because I was somewhat forced to train in a different way. Now, it`s a problem again, but rather to get rid of everything and just do it (when I know I can) as most people do it, I rely on a number of repetitions of an easier problem and regaining confidence in my own abilities once again. It`s a slower way, but I am not in a hurry. One does not progress from a single jump! – Do you think that through parkour you got to know yourself enough, do you think that you are going your way, do you do the things that really fulfill you and make you happy, regardless of parkour? I’m not even close to knowing myself completely, life wouldn`t be so much fun then! All in all, I am satisfied with my current life, but I am thinking more about my future (I do not even know how good that is). I cannot do only the things that really fulfill me, for example cleaning the dusty shelves around the house do not fulfill me at all. At the end of the day I am just trying to be happy, which is difficult if the result is poor. – How do you imagine yourself, your parkour and activities associated with it in 30 years? I didn`t go that far yet, the most I have been looking into the future is 15 years from now. I cannot know how things will develop, and whatever comes to my mind is pure fantasy, but I would love (and I am striving towards it) to be a traceur then too! *See question # 3! – One word that you associated with parkour when you started, and one word that you associate with parkour today? – Do we need a goal in Parkour? Do you think that everybody needs goals? Certainly. People without goals are the poorest people! When you fulfill your current goal, you set a new one. That`s how you progress in any aspect of life! – Since all of the parkour organizations are engaged in expansion of parkour, why is it good to have more traceurs in the world, except for money aspect from schools, clothes, commercials …? Parkour is beautiful in every sense of the word. Why be selfish and keep to yourself something like that? 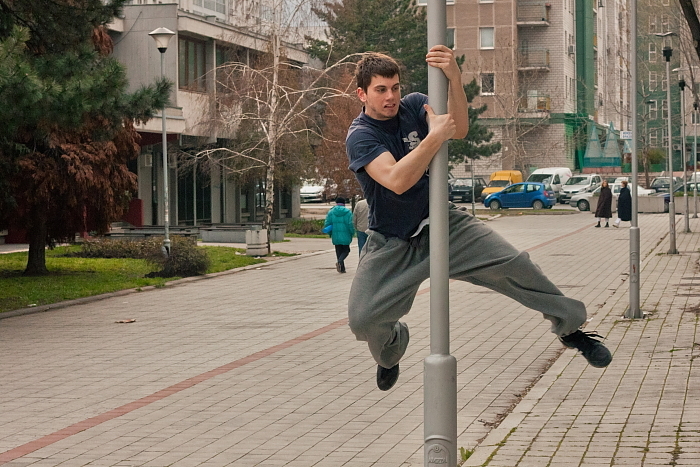 – Do you think that parkour in Serbia laid the foundation of proper independent development? Proper yes, but not independent. The community is more or less organized, and the people are well connected. Everyone knows where to direct someone and we all share similiar opinions. On the other hand, if let`s say Bogdan was kidnapped and never returned, I doubt that the community would continue to function this way, and that is what is troublesome. – What do you think about parkour schools, colleges, certificates (A.D.A.P.T. for example)? I support everything if it is doing a good job, and if there is a good reason behind doing it. ADAPT, TRUST and other programs have (as far as I know) contributed a lot and they have a purpose in certain countries. On the other hand, in the Balkans, anyone can do what he wants, so I do not see the point of those certificates here. – Do you think that the spirit of competition around traceurs has only bad influence on the discipline, or is there something good? I have been thinking a lot about this question, and I didn`t come up with the best answer. I believe that it has a bad influence, terribly bad. Competitive spirit causes jealousy and vice versa, and this is one of the worst atributes. And not to mention that all this is against the philosophy of the discipline. I still have not managed to find the good sides of competitive spirit, but if someone thinks of progress, I just want to tell him that the physical progress is irrelevant if you don`t progress mentally. Now, if someone thinks he can progress mentally in parkour through competitions, he should rethink about his parkour. 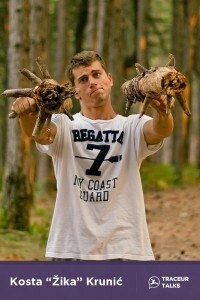 – Do you think there is a “training for parkour” and “parkour”? Parkour is defined thing. 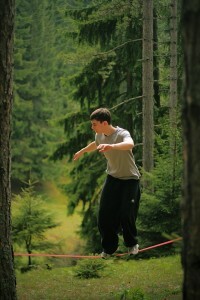 I don`t remember that I saw in any article the term “training for parkour”. If parkour is a training method, and you train for this training method… None of this makes sense to me. We should stick to defined things and stop making up new definitions. Just as you cannot change the Newton`s law, you cannot change the parkour also. – Do you go to the gym, and do you use nutritional supplements? There is not a month since I started going to the gym, and I already feel a lot of benefits. So far the best addition to my training definitely, but I do not recommend it to everyone. Proper nutrition is the most important, and the supplements are effective when you are not able to get a variety of foods (at least that’s how I plan to use them). – And finally, what would you say to traceurs in Serbia? Beware of the people in sneakers for big things hahaha! Eat Healthy! For each action you need to know the reason, that is, why you do it. Do not just jump around. Find something that you are good at, and stick to it, because there must be something that is your “specialty” (whether it`s parkour, art, science, cooking …). The worst thing you can do is to lose yourself, therefore, find a purpose! For Parkour Serbia translated by Dejan Kostevski.